Sometimes you don’t know how much better your morning can be until you have added a few of these subtle but essential creature comforts to your bathroom. Here’s our Top 5 update recommendations improve the comfort of your bathroom and bring more joy to your daily routine. The master bath of this 1922 Colonial Revival home was renovated and expanded by Arciform. Designed by Anne De Wolf. Photo by Photo Art Portraits. Whether your morning routine is too tight to allow for sequential showering or you just think that most things are better when done together, a shower alcove with room for both partners to shower at the same time can add enjoyment AND efficiency to your morning. This bathroom renovation by Arciform in a 1909 Queen Anne in the Forest Park neighborhood focused on highlighting the original architecture with a few luxurious amenities. Designed by Anne De Wolf. Photo by Photo Art Portraits. The joys of a full sized tub you can really immerse yourself in cannot be overstated. One expert tip: Consider the view. 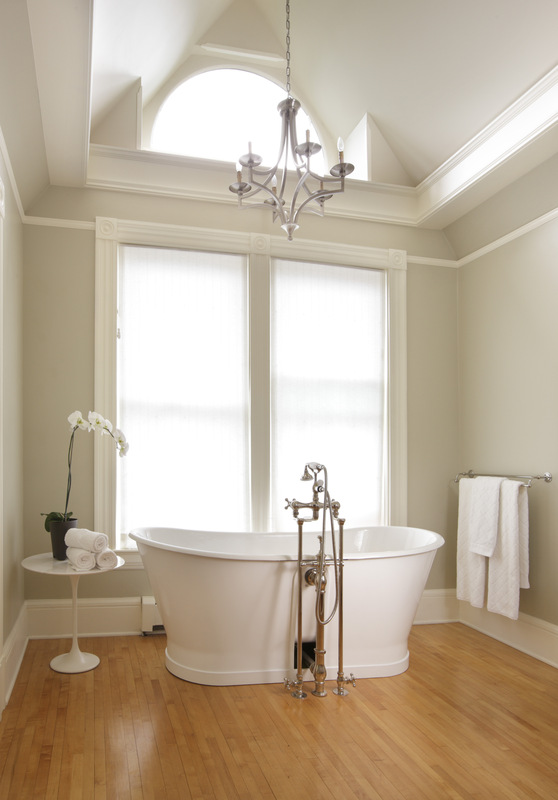 A tub designed for a long soak should have something beautiful to rest your eyes on while you relax. Whether its a beautiful window flooding the room with natural light or simply your favorite work of art hung right at eye level, the right view will create a space that invites reflection and encourages you to linger. 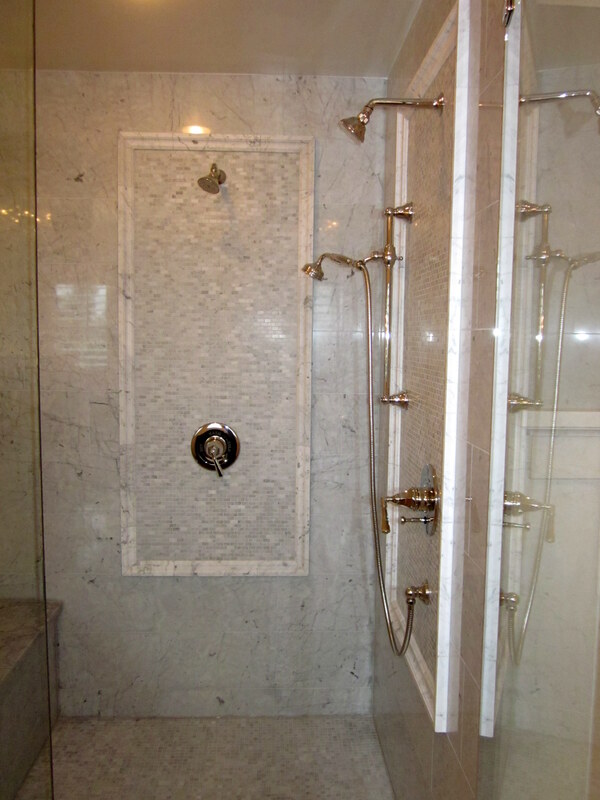 When you are done, an elegant handset will allow you to rinse off without the shock of of a full shower. This mid-century home in the SW Hills was a big change for the Arciform clients who had formerly owned a Tudor home. 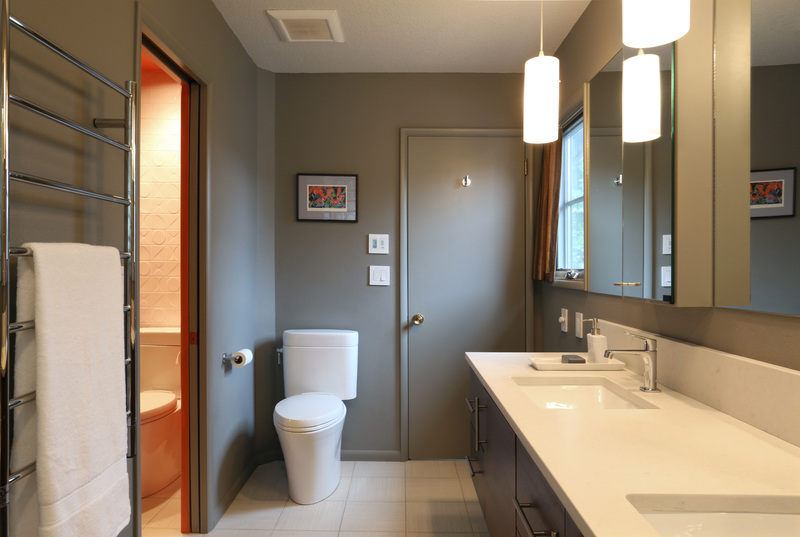 The bathroom update focused on clean lines and comfort amenities that both members of the couple could enjoy. Designed by Anne De Wolf. Photo by Arciform. If you are planning to pull up the flooring anyway, consider tucking in electric radiant heat. Having your bare toes meet warm tile will make the whole process of getting ready a pleasure. Plus, the whole bathroom will stay warmer. Detail view of the bathroom flooring of our mid-century client. Designed by Anne De Wolf. Photo by Arciform. This mid-century bathroom update added radiant floor heat beneath the large format tile in the main bath area and a pebbled surface to the shower alcove to gently massage feet in the shower. 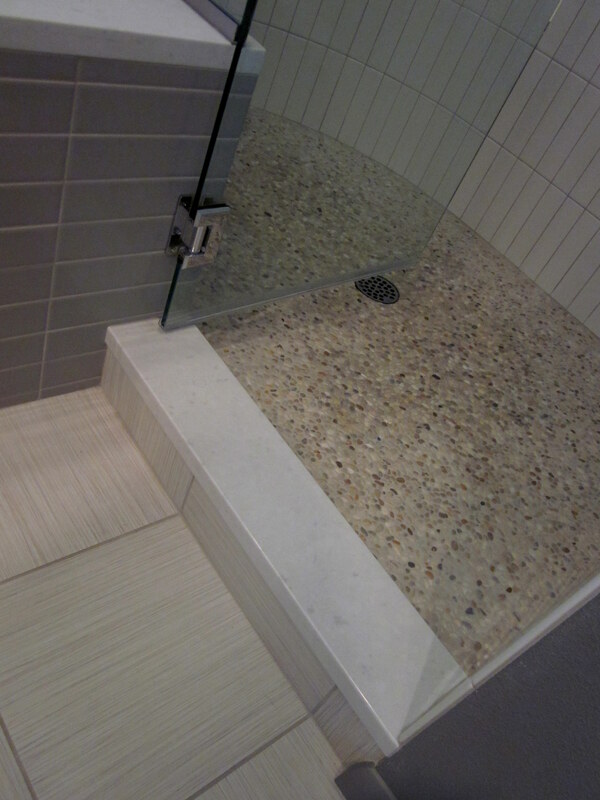 As a bonus, the pebbled surface resists slipping: always an important bathroom consideration. 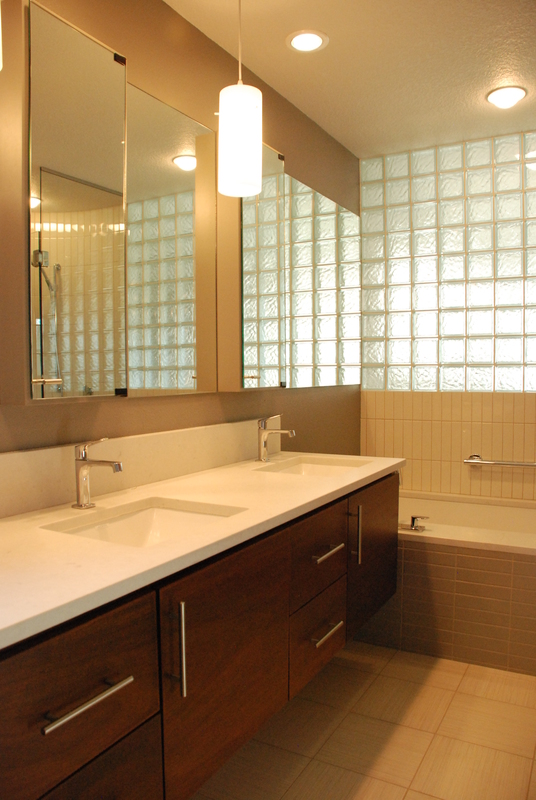 This bathroom renovation also incorporated a powder room for guests adjacent to the main bath. Designed by Anne De Wolf. Photo by Photo Art Portraits. A towel warmer like the one at left ensures that getting out of the shower is as relaxing as getting in. And while you are at it, how about a heated toilet seat? Or a heated mirror that won’t fog up during your shower? 1. Why Not Add a Washlet? 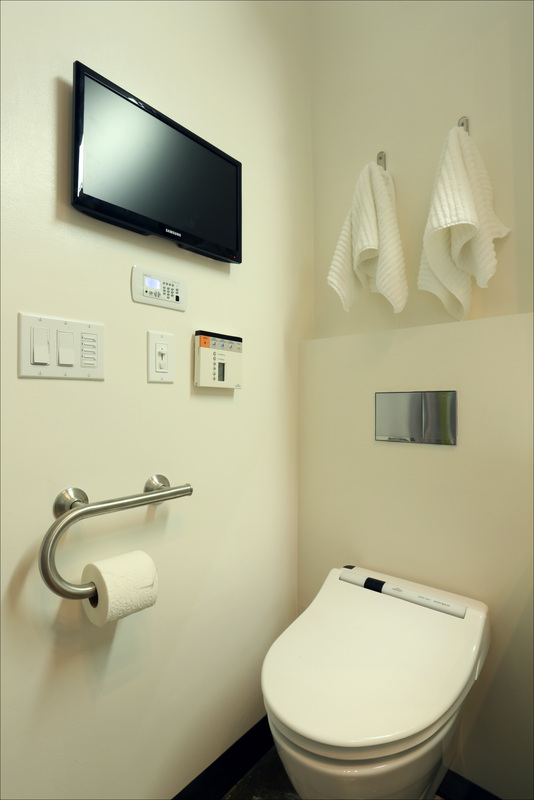 The couple who has retired to a Pearl District loft asked Arciform to install several cool technology features, including a “washlet” on their toilet with a wall mounted control. Designed by Kristyn Bester. Photo by Photo Art Portraits. Most older homes do not have room to accommodate both a toilet and a bidet… but any home can consider adding a “washlet.” This ingenious piece of technology installs like a regular toilet seat but functions like a bidet to provide warm water to your most sensitive places just when you need it. How supremely civilized! What comfort amenities are you considering adding to your bathroom? Join us February 18th for a Master Suite Design Workshop to get inspired for your next project. Details and RSVP here.